Restaurants generally fall into two camps: those that let you know almost immediately that you’re lucky to dine there, and those that go out of their way to let you know how lucky they are to host you. The latter are becoming increasingly rare. For over-the-top hospitality and an intoxicatingly good time, I heartily recommend CWC the Restaurant. This place is one hell of a party, with fantastic food. 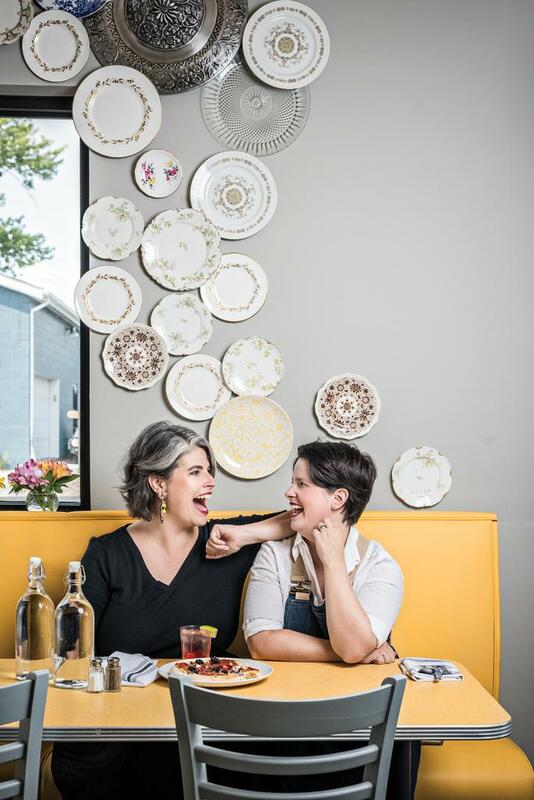 Before visiting, I was aware of sisters Caitlin Steininger and Kelly Trush, the duo behind the culinary multimedia platform Cooking with Caitlin. When they weren’t catering, filming culinary how-to videos (72 and counting), and posting recipes on their website and social media accounts, they were raising families like a lot of other working moms. I didn’t know them personally but I admired how they appeared to be killing the working mom balance. Within 10 minutes of stepping inside CWC for a Friday-night dinner, I met Trush, CWC’s ringleader. To describe her as a manager would be downright stingy. Trush’s canny ability to make others feel welcome, all-important, and well cared for is so genuine that even hardened skeptics such as yours truly fall hard and fast for her expansive and quirky personality. Yes, Trush greets all diners to CWC with the same excitement and eagerness. Think back to your childhood reception at a beloved grandmother’s house. There’s hugging and high-fiving and plate after plate of the kind of insane carb-y goodness that nobody would dare track on Weight Watchers. Exhibit A: Chef Steininger’s petite feather-light biscuits. Two inches high, they’re only about the diameter of a silver dollar. Which is why it doesn’t seem so wrong to eat three. (It would have been a crime to let the accompanying spicy tomato jam go to waste.) And then there were the grilled chile-spiced carrots served with an herby buttermilk drizzle. It’s basically carrot sticks with ranch dressing tarted up for the over-12 set. But the flavors were so bold and complex that I’d drive across town to order them again. CWC succeeds on its ability to make comfort food feel a notch more au courant. Burgers are topped with a generous ladle of gooey housemade cheddar sauce and served with hand-cut French fries that many a mother will filch from her offspring’s plate. 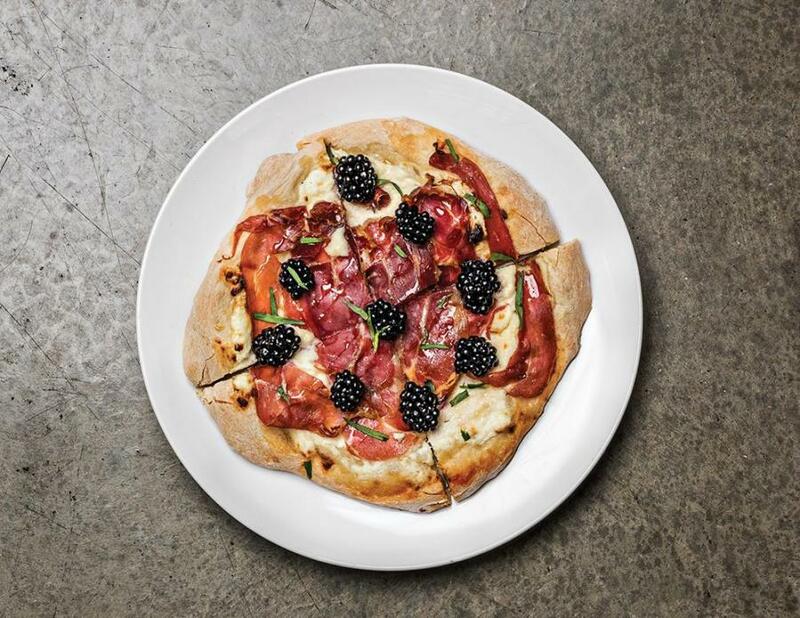 And true to their family-friendly philosophy, Trush’s 13-year-old daughter, Blu, cooks the spicy sausage, ricotta, prosciutto, and blackberry pizzas that feature generous, hand-pulled crusts and scratch-made sauces and cheese. Steininger never attempts to reinvent the culinary wheel. Instead, she plays to her maternal strengths. She embraces classics and crowd favorites and then upcycles the hell out of them. 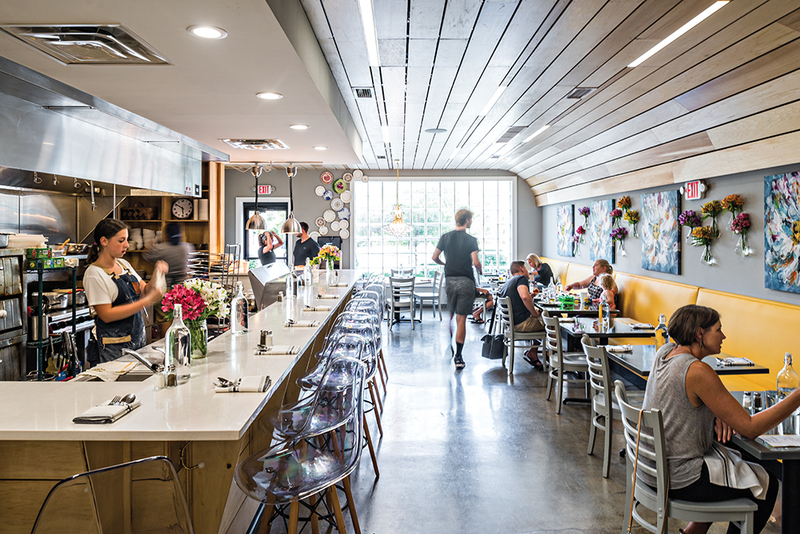 Portions—and flavors—are generous, again eliciting that feeling of being royally indulged. Yeast Doughnuts, blintzes, and a rosemary hound cocktail. Which is also how I knew that the desserts would be worth it at CWC. I grew up going to visit a grandma who baked like a sugar-wielding sorceress; I’ll often pass on dessert unless I know it’s of the highest caliber. Steininger’s version of Atlantic pie (find the recipe on the Cooking with Caitlin website) is a luscious concoction of sugar-roasted saltine crackers topped with a custard of lemon, sweetened condensed milk, and egg, finished with a big dollop of freshly whipped cream. It’s vintage summer personified. Then there was the rhubarb butter crumb cake with strawberries and basil. It was so irresistible that I ate the leftovers with my coffee the following morning at 6:30 a.m., leaning against the refrigerator. CWC is only open for dinner on Friday and Saturday nights and for Sunday brunch. Steininger admitted that after cooking all evening on Saturday, she typically goes home and takes a two-hour power nap before returning to the restaurant at 2:30 a.m. to start her preparations for brunch service. It sounds exhausting, but she assured me that her custom hip-hop and rap playlists, heavy on the Kanye, help her rock out CWC’s breakfast of champions. Sisters Kelly Trush (left) and Caitlin Steininger share a laugh. And what a breakfast it is. You need the blintzes. Steininger makes the three crepes to order and fills them with her homemade ricotta cheese, scented heavily with nutmeg, then tops them with a few spoonfuls of blueberry sauce. My Jewish dining companion was swooning and swore she’d never tasted better. Dishes that could possibly be construed as virtuous at other establishments get the full luxury treatment at CWC. The yogurt and granola parfait is made with full-fat Greek-style Chobani yogurt layered with strawberry jam and a “granola” made out of crushed graham crackers and peanuts. It’s like a spoon-able PB&J. 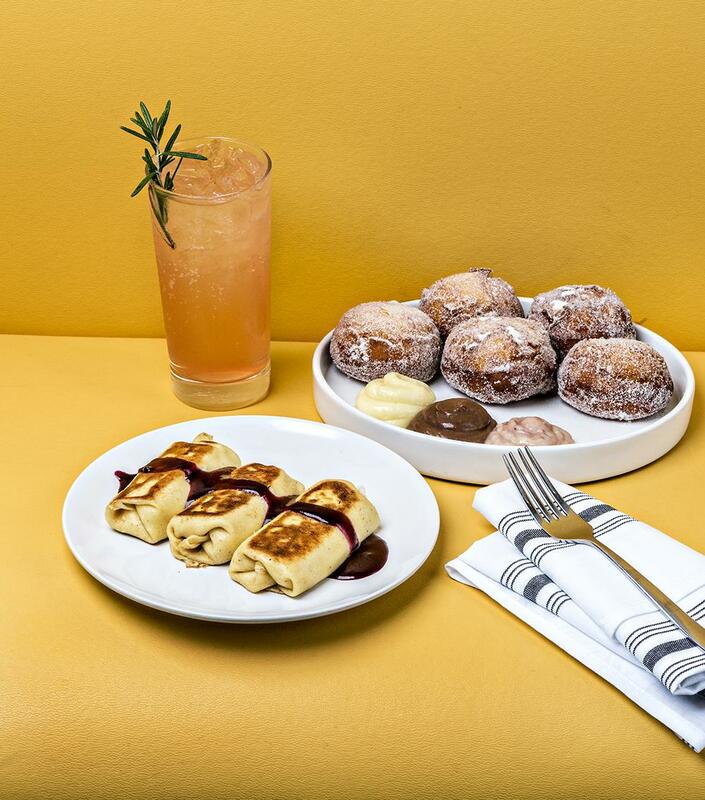 Then there are the piping hot tennis ball–sized yeast doughnuts served with pastry cream and Nutella, and the heavy-on-the-brown-sugar cinnamon buns the size of a salad plate. Every item on the brunch menu virtually dares you to go big or go home. On both of my visits, CWC was packed. Steininger and Trush have a dedicated following, and their Wyoming friends and family aren’t shy about showing their love with regular visits. Make a reservation for parties of more than four and plan to be spoiled rotten. Then plan to take a lengthy nap. Carb resistance is futile: These doughnuts, blintzes, and biscuits will make you beg for seconds. The real hospitality will make you come back.